DAVIS, Calif.; Dec. 13, 2017–The UC Davis Department of Electrical and Computer Engineering welcomes Weijian Yang upon his appointment as Assistant Professor. 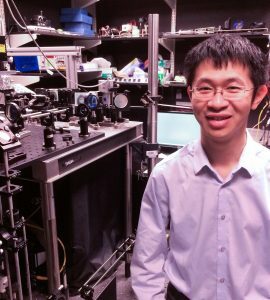 Weijian Yang specializes in electrical engineering and neuroscience, the scientific study of the nervous system, and is bridging the two fields together. His research interests include neuroscience and neuroengineering, 3D optical microscopy, endoscopy, implantable devices and in-vivo brain imaging, biophotonics, integrated optics and optoelectronics, and nanofabrication. After developing new advanced technologies for applications in neuroscience and biomedicine, he uses these technologies to better understand how the brain functions. Before joining the UC Davis Department of Electrical and Computer Engineering faculty, Yang was a postdoctoral fellow in the Department of Biological Sciences at Columbia University from 2014-2017. He earned his PhD in Electrical Engineering at UC Berkeley with a focus in integrated optoelectronics and nanofabricated devices, and his B.S. in Electrical Engineering and Computer Sciences at Peking University in Beijing, China. Yang is the recipient of the Career Award at the Scientific Interface from Burroughs Wellcome Fund in 2016. He also holds other awards and honors for his research papers and theses as well as his academic achievements at Peking University and UC Berkeley. In addition to his 11+ years of research, Yang authored and coauthored over 90 publications, with over 60 of them published during his time at UC Berkeley. He currently holds a patent (“High contrast grating based saturable absorber for mode-locked lasers and its applications in passively mode-locked vertical-cavity surface-emitting lasers”) with Professor C. J. Chang-Hasnain from UC Berkeley, C. Chase, and F. Sedgwick. His work has been featured in science news sites such as WIRED, The Scientist, Science Daily, Phys.org, and more.